Recently my blog has been feeling very left out. I have discovered instagram – the lazy blogger’s get out free card (of composing half decent prose that is). While poor blog here requires time, patience and a little bit of skill (all of which I am somewhat lacking), on instagram I can upload a picture of my cooking straight away with a sentence, nay, a word to accompany, plus some hashtags so that like-minded instagrammers (is that even a noun now?) can find me. Of course, you don’t get all the ramblings that come with a blog or the most important part which is the recipe of course. However, much of my cooking is so simplistic and relaxed that it barely needs explaining. But, I still do love the process of writing. It is calming, even therapeutic, and settles a recipe or idea in my head more so than the instantaneous but ephemeral-feel of a photograph. 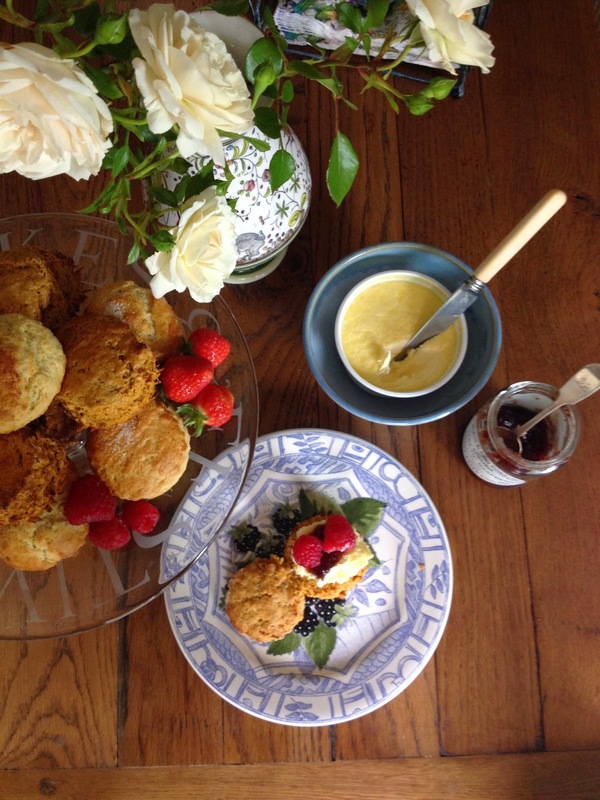 So to touch base here is the recipe for some scones I posted on instagram yesterday. When it rains in England we naturally revert to tea and cake. Yesterday it poured so there was nothing to do but whip these up. Scones are never going to be healthy (they are basically a vehicle for clotted cream no?) but this recipe, adapted from the clever Harry Eastwood, replaces much of the butter with grated carrot and the wheat flour with spelt which is so much easier to digest. The result is a denser but more satisfying scone which has a lovely warmth from the addition of grated ginger. Harry also adds in sunflower seeds, but I wanted mine plain and simple so as not to detract from lashings of clotted cream, jam and fresh raspberries. I also made some plain scones for the traditionalists. In a food processer mix 180g Wholemeal Spelt Flour, 40g Rice Flour, 2 tsp Baking Powder, ½ Bicarbonate of Soda and 200g peeled and finely grated Carrot. Add 20g peeled and grated Ginger and 2tsp Honey and mix until the mixture comes together. Tip onto a lightly floured surface and roll delicately to a thickness of 4cm. Cut out rounds with a 6cm pastry-cutter. Re-roll and cut again (the second roll is never as good so try and get as many out of the first roll). You should end up with 8 scones. Place on a baking tray lined with parchment and bush with some beaten egg. Bake for 17-19 minutes. Serve warm. these look delicious! and yes a vehicle for clotted cream.... which happens to be my favourite!